Why do people exercise? Why do people go on a diet? It’s because they want to become fit, which is very important for every individual. The only thing when it comes to people wanting to become fit is that they only focus on the physical aspect, when in fact, they should also include their psychological and emotional well-being as well if they want to be fit inside and out. You may also see sports & fitness brochures. Below is a collection of brochures that are ready for downloading and editing, and we have gathered these templates from multiple sources for your convenience. 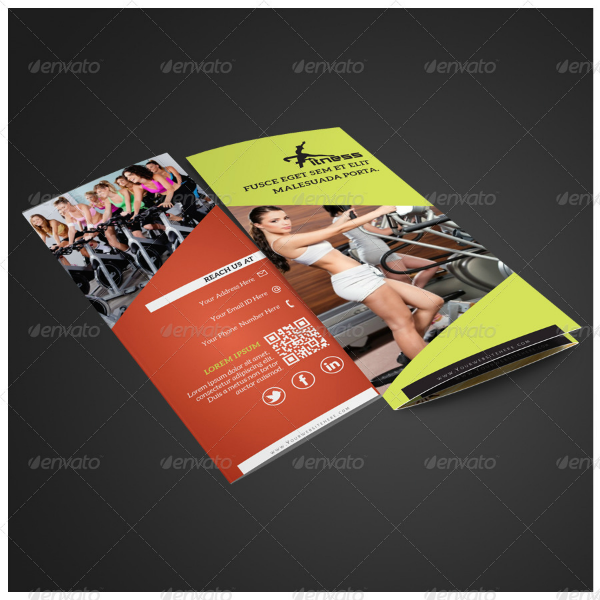 You’ll be able to find creative brochure templates here for promoting gym and fitness centers, and also for yoga studios to those who wish to promote peace and inner balance as well. Check out the various templates below by scrolling down. Many people may not know it but psychological and emotional distresses can eventually manifest itself on the person’s physical well-being. This is the reason why problems such as these should be intervened because they are just as harmful as physical conditions. 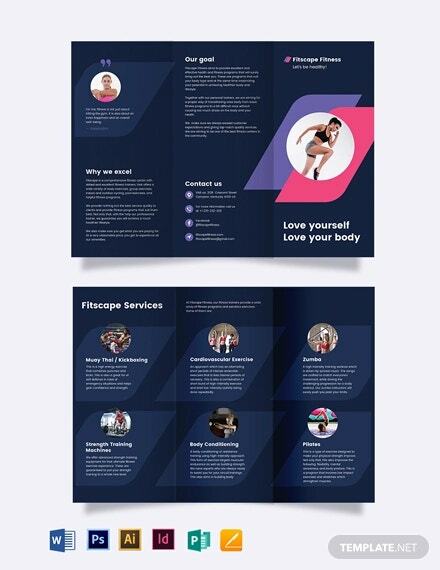 If you are an advocate to fitness and you want to promote your cause as well as your business to the public, then we might have what you need. You may also see corporate fitness brochures. Without a doubt, brochures are indeed effective during sample marketing campaigns which is why they are still being used up to this day. For such a very small size, brochures are able to cover a large amount of information and can deliver the necessary message to its audience. Once a brochure is effectively able to reach its prospects and gets read, the prospect will right away get a good idea of what the business is about and what is being advertised, and that will only take a matter of seconds. 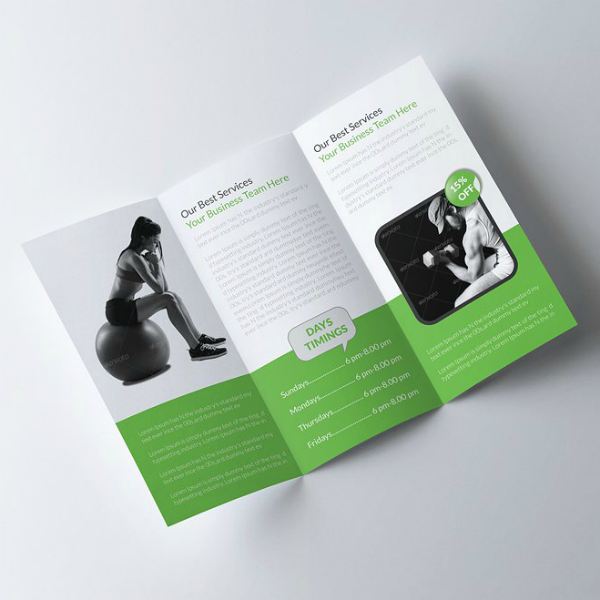 Businesses can choose to either make their own brochures or to have them made by professional printing businesses, but regardless of which, you won’t need to actually spend a lot to get them made. If you choose to make them yourself, then you can make use of downloadable business brochure templates found all over the internet, edit them, and have them printed. Otherwise, you can hire professionals to the job for you, and the best thing about this is that these businesses may also offer to give discounts for bulk orders. Brochures can be used for different purposes, by different businesses or organizations, and this versatility is what makes them popular. 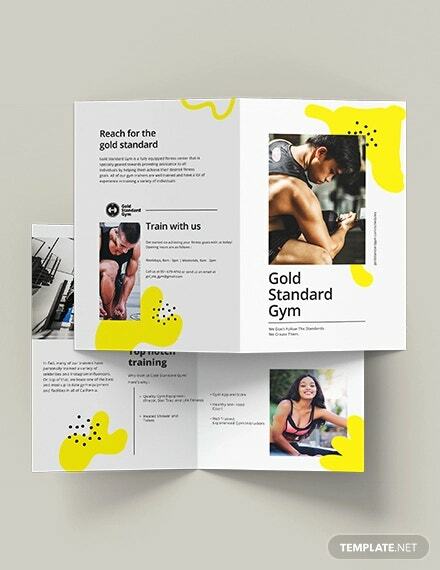 Even if you decide to print a whole bunch of brochures for a single campaign, you can assure yourself that no copy will be left unused if you only know how to distribute them. Later, you’ll find out other means in which brochures can be sent to your target audience. You can also read gym brochures. Most commonly, when people think of brochures, they usually associate it with those marketing tools that being placed on a table or countertop and are often confused with rack cards. 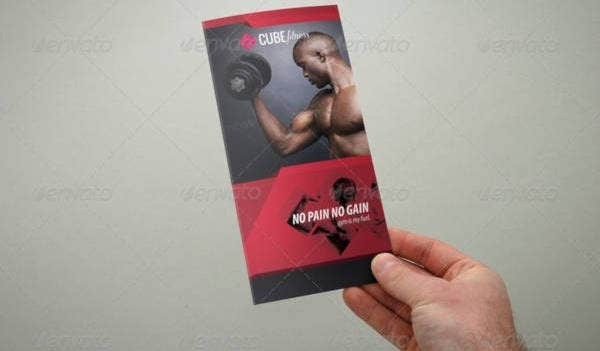 In the same manner, people immediately associate flyers with those that are being distributed by hand and posters with those that are being attached to walls. Going back to brochures, they can actually be distributed in more ways than what people might know, and below are some of the most common means of how it’s done. 1. Brochures can be placed on a rack or a container the same way rack cards are being distributed, just make sure that the location where you are placing your brochures appropriately fits your purpose. 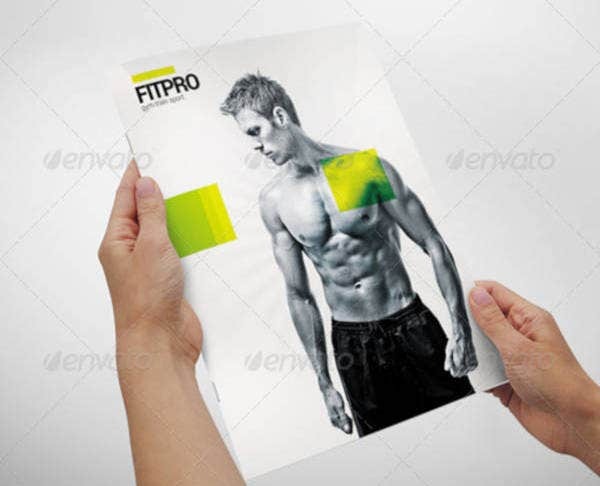 In this case, since we are trying to distribute fitness brochures, you might want to leave it in an office, a health center, a food establishment for health enthusiasts, or in another fitness center. 2. 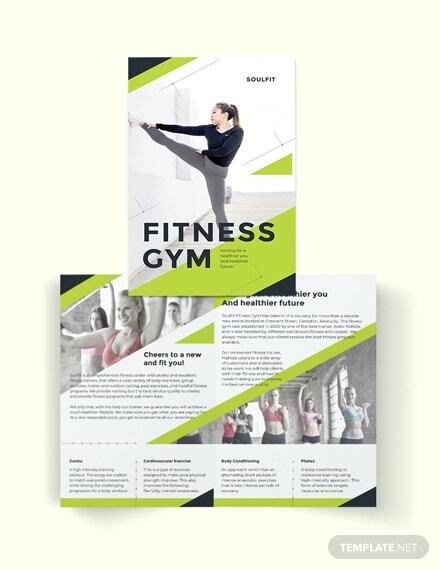 In addition to simply leaving your brochures in appropriate locations, you might want to place them someplace where there’s an event going on that fits the message on your brochure, such as health or fitness seminars and conferences. 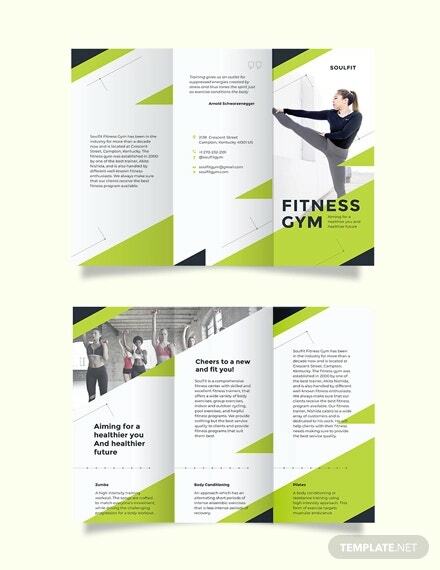 You may also see corporate fitness brochure templates. 3. You can also send advertising brochures through the mail, and we’re not even talking about email. After looking at various references for possible clients who might be interested in your services, you can send your brochures to them by mail. 4. Coordinate with publishing companies to have your brochures placed inside each copy of their newspaper or magazine. This way, for every newspaper or magazine that the subscriber receives, they will also get a copy of the brochure. 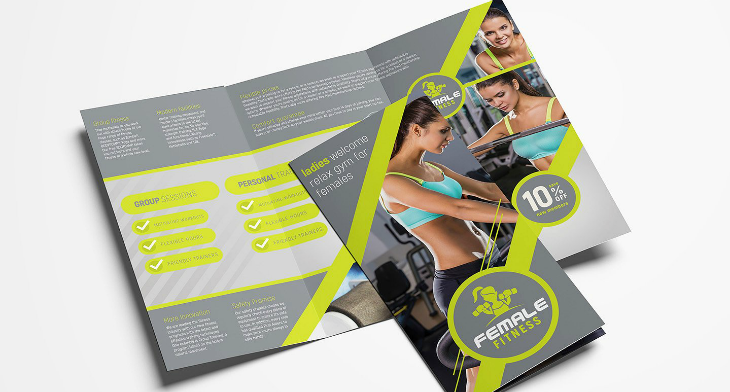 You can also read fitness brochure samples. 5. 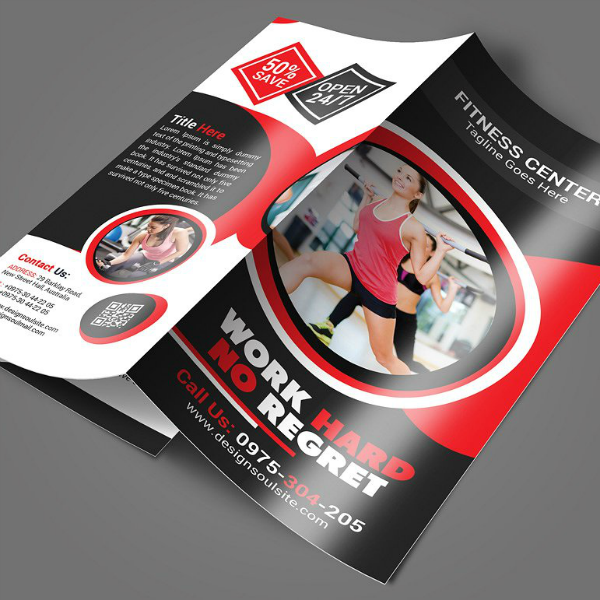 A soft copy of your brochures can also be placed on your website for users to download and print out themselves. When doing this, make sure to really emphasize on your call to action and let users know that the link can be downloaded and printed if they want to. When choosing between flyers or brochures, people often wonder what the differences are between the two marketing tools. 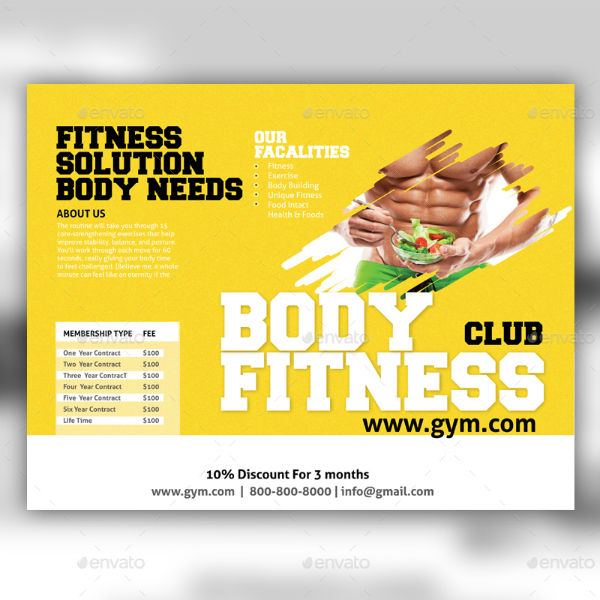 From its physical appearance alone, you’ll find it very obvious that the difference between flyer designs and brochures is that the latter is usually presented as having folds or multiple pages. 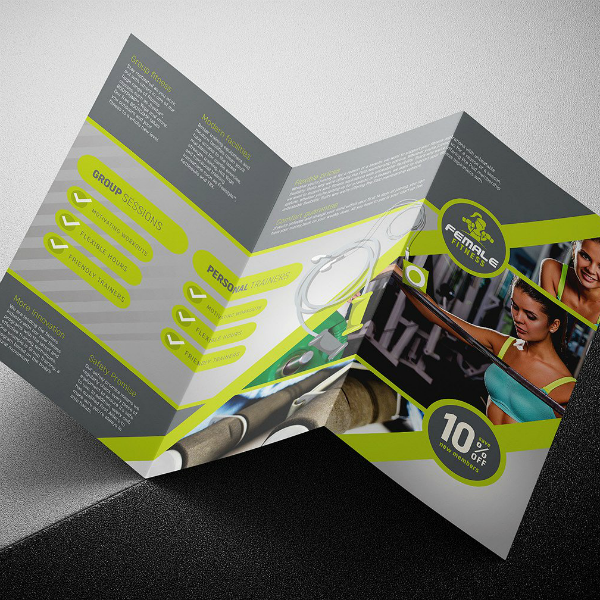 In terms of the different types of brochures, it actually focuses on the number of folds and panels on the brochure. 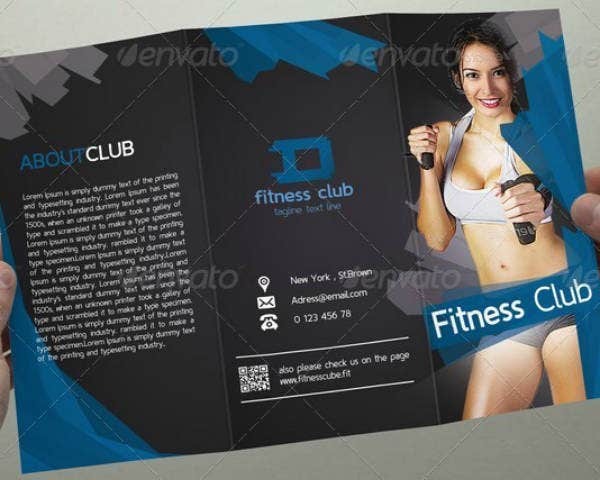 Below are some of the types of brochures that are commonly used during marketing campaigns. If you’re planning to advertise products or services through a simple business presentation, then the bi-fold type would be the ideal choice for you. While all half-fold brochures can also be considered as bi-fold, not all bi-fold brochures can be half-fold. The reason behind this is because not all bi-fold brochures are actually folded in the middle, though this will mostly depend on the preference of the designer. 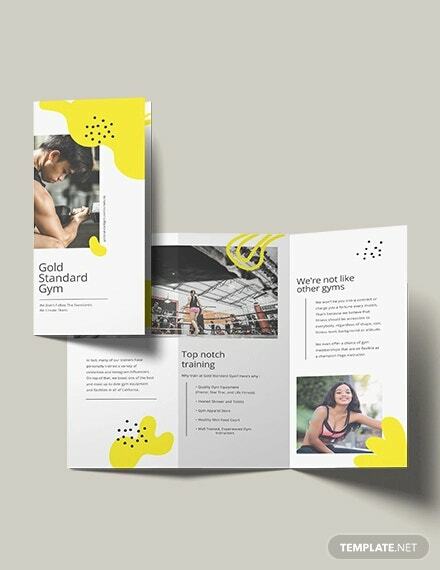 This type of brochure has two equally-divided folds and a total of six panels—three on both sides—which are perfect for short content that are divided into multiple categories. 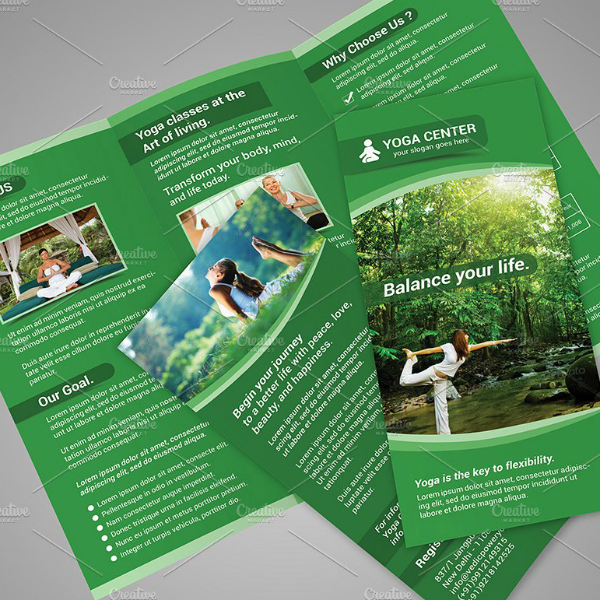 Classic tri-fold brochures are compact in size and are easy to unfold and read. 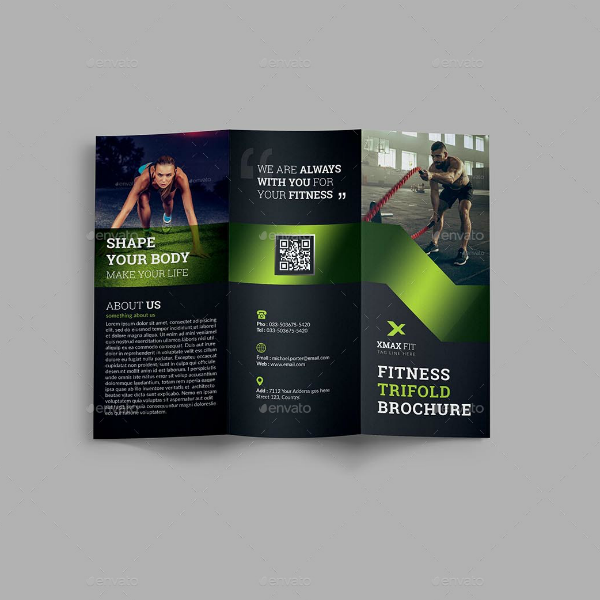 This type of brochures are relatively similar to the classic tri-fold type, with the only difference being the distance between the two folds. For the gate-fold type, the total size of the two side panels are equal to the middle panel, resulting to the two edges meeting up in the middle when being closed, hence the name. 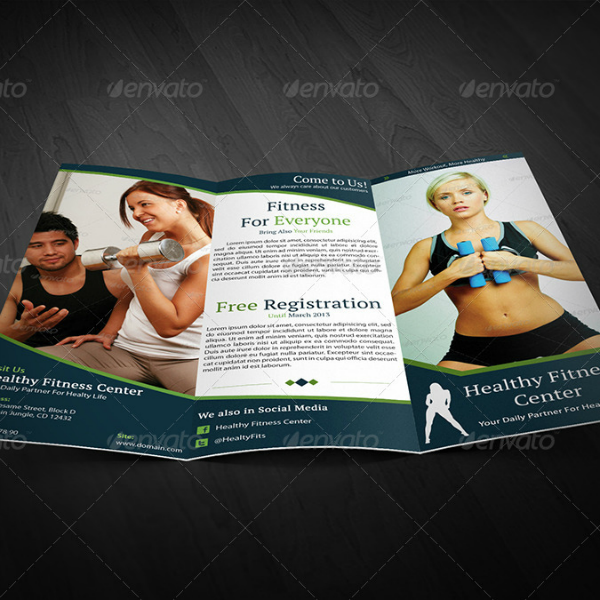 This type of brochure is commonly used for advertisements that are heavy on the graphics. You may also see sports brochures. Previously, we have mentioned about important elements that should be included on your brochures and nothing else. 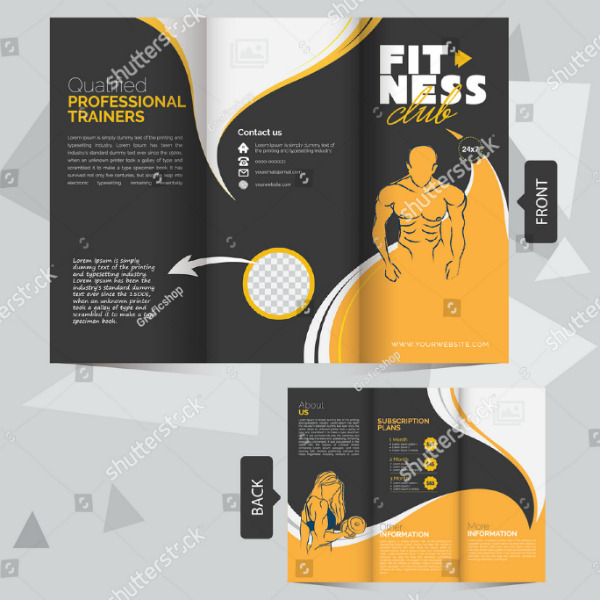 This time, we’ll be talking about the other factors that should be considered when designing your own fitness brochures, and these are also applicable if you choose to use any of the templates in this article. So if you want your brochures to stand out and be able to attract prospects easily, take the time to read the list of guidelines below. You can also read corporate training brochures. 1. Do identify and keep in mind the purpose for your use of brochures. From the planning phase itself, it is very important that you know why you are making brochures in order to know how to make them. Once you are able to determine your purpose, you can use that as your guidelines during the entire designing process. You may also see healthy food brochures. 2. Do focus on how you can make your cover page really stand out and really attract attention from the audience. Just like story books, the cover page of a brochure helps to create its initial impression, and when it goes well, the prospect will want to continue reading through the rest of the pages. 3. Do make your call to action clear for the reader, it is at this point that the reader will become motivated to reach out to your business either to make inquiries or to actually avail of your services or products. Make sure that your call to action is clear and direct, otherwise, it will most like get overlooked. You can also read fast food brochures. 4. Do add white space to your brochure design, and don’t be shy to use them a lot. The use of white space easily gets overlooked by designers mainly because they are too particular on adding a lot of elements. However, this will result in making your brochure design overly cluttered, which is why it is important to keep the design simple and to add white space. This way, the elements will have enough breathing room and will also be distinguishable from one another.